This isn’t just a dip, it’s a Prime Rib Dip, which is special. The price was $13.99. They had bottomless fries or potato chips, but I opted to sub for the salad for a 99 cents with Bleu Cheese dressing, which is my staple. 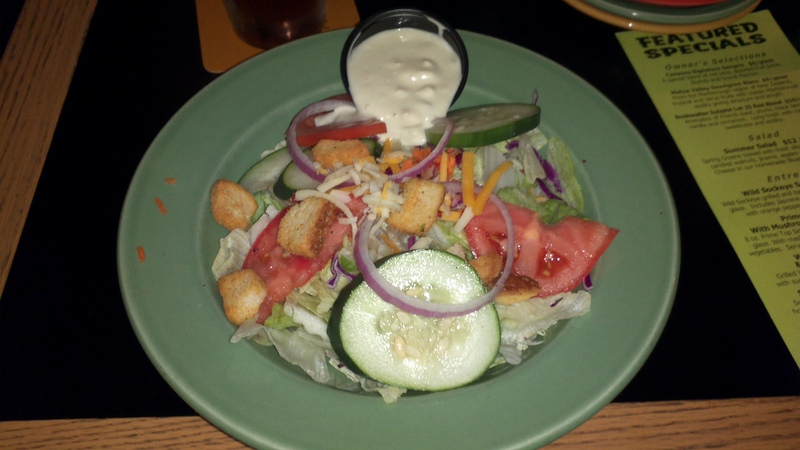 The salad it was served with was pretty good except it was iceberg lettuce, not a favorite of mine. Besides that it had good, chunky bleu cheese, good tomatoes, cucumbers, red onions (which I love on salads), good croutons, and some small shavings of cabbage and carrot. Good-sized salad, rather large for a starter salad. The dip looked excellent when it was served. The meat looked very meaty and the bread was beautiful. You can see from the photo that it has a sheen to it. I was very impressed. And the melted provolone looked really good. I was excited! The overall portion looked quite good as well. The bread was rather wide. You’ll note that the Au Jus looks a little empty and I later ran into problems with this. No skewer in this bad boy. This bread was really lovely and tasted good. Firm and crunchy. The sheen is what really made it for me. This was the first prime rib dip that I’d reviewed. It was worth it. Tender, medium rare. Not fatty at all, which was good. Lean. For the first time in any of my reviews, the cheese actually added something! The provolone was mild but it’s hearty texture gave the sandwich a little something extra. The au jus was fair. Overall it was pretty good but nothing to really write home about. The portion was too small. As I neared the end of the jus, I asked the waitress for more, which took quite a while to get more. I had to wait with a portion of my dip for the refill to arrive, which is a strike against. Some visible fat in the au jus, which I think is a sign of a good one. Mild flavor, not overly salty and not too dark. The portion was perfect. A bit on the bigger side, which I don’t mind. The bread, as I mentioned before was wide. Overall, this was a very good sandwich. Wonderful and pretty bread, really good medium-rare prime rib, delicious and hearty provolone, and pretty good au jus. The only complaint would be the au jus, which was good but not great, wasn’t enough, and the refill didn’t come in time. The ambiance in here’s not bad. It was reasonably crowded and looked like other folks were having a good time. 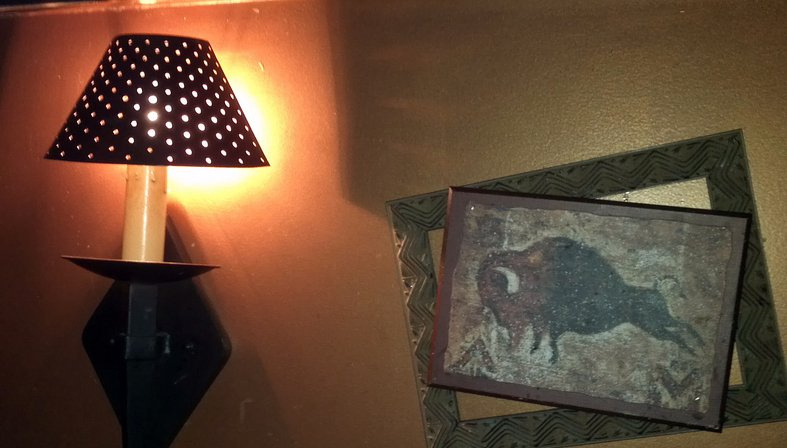 They serve an interesting blend on the menu from a Thai Peanut Chicken Wrap to Ribs, Steaks, Burritos, and Pastas. Overall, this was a good dining experience. 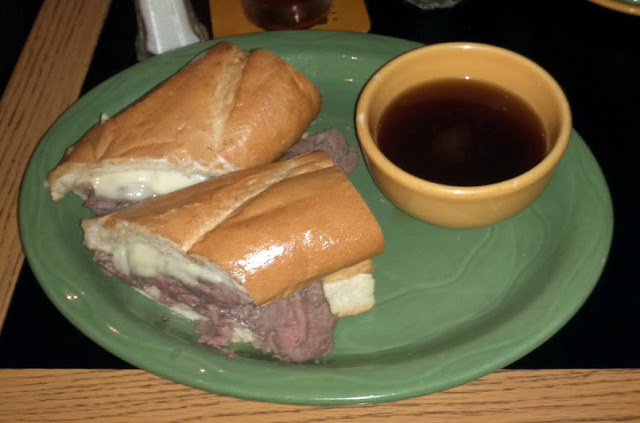 Everyone I was with enjoyed their meal and I got to review another (very good) French dip. Very good looking, good tasting, big. Really nice looking and tasting medium-rare prime rib! Good, mild, not too dark, not top shelf. Great dip, great bread, provolone, and meat. Reason to go back: a really great dip, other fun food. French Dips are one of my favs! 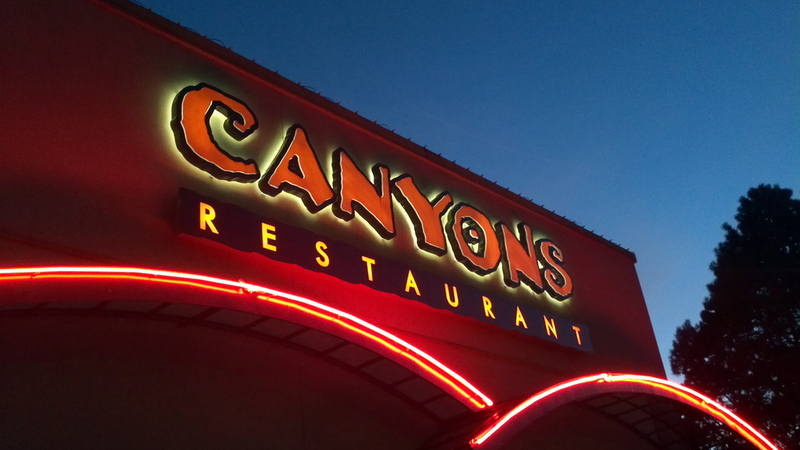 I'm not sure if we have a Canyon's located down here in Portland, but I'll be sure to check around. Everything about the review is excellent. I hope the silverware, plate and drinking glass came in superb condition as the sandwich and dip...ha! There's nothing like a large black floaty in your drink to ruin the experience. @Charlotte, RE: the scoring system. Yeah, I really fought it because I want to just review. But I think I have to rate as well. It's a simple system. There are many other dimensions that get left out by just having four things I look at, but I think it works. The thing I like most about it is that I can do -589 if I really hate something and 722 if I really like something, while 0-5 remains the target part of the curve. @Charlotte continued: ...so I'm looking forward to the first time I go BEYOND the 0-5 range for true outliers. Right now, I'm just setting my bearings and assume that most things will fall within the basic scoring system.